It was a bright, sunshine-filled sunny day. Fun sounds, surfboards, colored umbrellas and sunbathing people on the beach. It was as picturesque as it could get at a beautiful beach in Napier, New Zealand. Innocent and fun loving twelve-year-old Josh McQuoid was in the water splashing and cheering in knee length waves with his friends. Suddenly out of nowhere a strong current came in and swept him off his feet and the effect of the current took him away and very far from the shore. The power of the waves was so intense that he lost control on his body and had to struggle and strain to keep his head high up above the water. While all this mayhem took place two Napier police Constables took notice of the situation and along with the help of another beachgoer jumped into the gushing waves to help the boy but the waves were not letting anybody else that day.After they realized that this effort was not enough Constable Bryan Farquhason. Random people on the beach got together and a long human chain was formed. 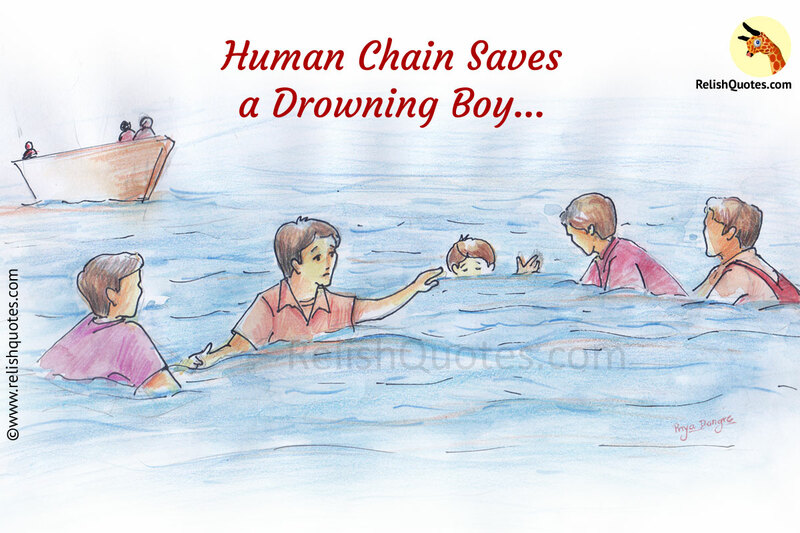 Everybody held hands, literally, to save a boy drowning in the sea and helped the child get back on land, with the help of this human anchor. Holding each other’s hands in tough times solves and wards away any kind of problem. Five fingers come together to form a hand, likewise collectively a group of people possess the strength to fight against all odds and save a life. Unity is strength.